Who doesn't love the sweet and wonderful Clangers program. It's one that I'm always happy to let the children watch on television as I know that it's going to show them a good example of characters being kind to each other and setting a good example for children. So of course when we were asked to be a part of the Clangers for Kindness campaign we were happy to take part. 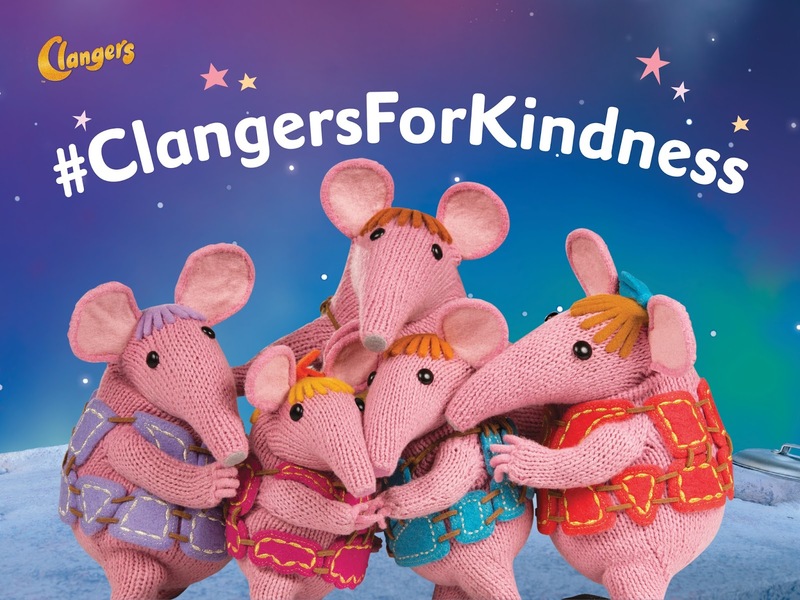 Ivy loves watching the Clangers and she loves playing with Clangers toys as well, what a wonderful way to start to bring the example of kindness into the home with some small world play with these adorable little toys. We are also giving away these toys to one lucky winner, please enter below. The main lesson that I teach my children each day is to treat others as they wish to be treated, but we do like to go above and beyond to be kind to people as well. One of our favourite things to do together is baking. This is the perfect way to have some fun family time together making something really special, that we can also share with others. We definitely don't need to keep all of our baked goods for ourselves so we often bring over to our friends' houses for playdates to share with them. Once in a while we make an especially big batch of cookies or muffins and package them up and deliver them to our neighbours. The kids absolutely love making these surprise packages and drop them off on our neighbours doorsteps. What sorts of kind things do you like to do together or encouraging your children to do? 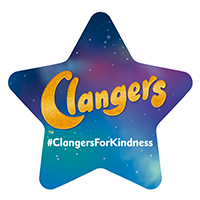 Please enter below for your chance to win some Clangers toys. I try to walk outdoors as much as we can, it makes for great conversation and adventures. I encourage my son to be kind and to help others. Baking and playing family board games! When we see a homeless person we always go into a shop and buy them a sandwich to be kind. Colouring, not just playing on the computer all of the time! i am always telling nieces little ones to get outside and enjoy the fresh air!! We play a lot of sport because one should always encourage children to your meal ticket so one can retire early. We love going on walks making them as fun as possible, and we love baking and icing cakes. Make sure they say please and thank you and be kind to others. I like to crafty things with the girls and as they have got older we like sewing together. We enjoy doing jigsaw puzzles, games and crafts with each other. I love to take my boys to the park and on the way home I always ask my oldest (he's 2.5) to point out anything that he really likes (it's usually a train or plane, his two current favourite things!) and tell me about them! When his brother is old enough (He's nine months) I'll ask him too! We always encourage them to say please and thank you to everything. I encourage my children to do lots of arts and crafts and we always make things together. We love baking.. part of our everyday activities. I encourage my kids to be kind to each other and teach them about empathy. We like to get out and see the changing seasons and how they affect the hedgerows and seaside. We like going out for walks. I enjoy baking with my children, we all get messy and have something yummy to eat when we are finished! We love to bake together and read lots of stories! We love arts and crafts. It gets messy but lots of fun and with kids aged 5,8 and 14 it's something we can all do together. We walk together lots and we love playing sport together. We kicked a football round today together and in the summer we love playing rounders, cricket etc. Being active as a family is so important for your childs confidence. I like to go to active outings and museums with my daughter - activities that teach us both and that we can have a good time together at. My little boy sees people upset on the tv and says he's going to give them a cuddle! We love playing games together, hide and seek in the garden when it is fine, cooking together and reading together. We love playing board games. Trying to teach my children that you can't always win but also how to share, can guarantee they always want the same figurine/game piece. Manners are very important & I just need to do a little look at Sophie now if she has forgotten her manners & she soon remembers them again. Trying to get the kids to play and share together nicely. Cooking with kids is always fun, and messy! I am big on manners and constantly remind the children to remember to thank those who have done something to help them in some way. We also talk about the importance of kindness to animals and the benefits of giving used toys and games to the animal rescue charity shop. We enjoy frequent trips to softplay, the local park and playground and take the dog for a walk through the woods at the weekend. You have to enjoy time together when the children are young as they grow up all too soon. We love to go on lots of long walks together. We love to bake. Also we enyoy long country walks , visits to all the local museums and chilling in front of the fireplace watching festive filns. Lots of arts and crafts!! I think it's very important that children learn to say please and thank you and i get my son to always write a proper thank you letter to people for any gifts he receives for Christmas and birthdays. We love to bake for other people too :) I also feel there are just small things that should be a part of everyday life such as holding a door open for someone, so those are values I want to instill! Love getting out into the woods & letting them find all sorts of intresting things. Lots of drawing, reading and playing doctors. Sorting out their old books, toys and clothes for charity. We bake together and dish them out to the neighbors. every christmas we do the shoe box appeal and the kids go though all unwanted toys clothes etc to make up around 5 shoe boxes each that get sent to children that have nothing. we love to read books together. We love to go rock pooling together. My 4 year old loves space so we often go to the science museum and he loves star gazing! We like to sort through all of their old toys and clothes for charity. I do not have children but I would love to donate this to our local bank where they have a collection for needy children every Christmas.I always buy something for them anyway. lego, making pizzas and movie time. We like to do gardening together, planting seeds and finding nature in the garden. Arts and crafts is our favourite! We can make things out of egg boxed, cardboard even just some paper and glue! We do a lot of cooking together. Days out exploring! Even just a walk in the woods, or a walk around a castle :) It;s my fav way to spend time as a family! We love baking together, crafting together and we love going for long nature walks at the weekend! We like to do crafts on Sunday afternoons. We love playing games together, and making the children smile!! Geocaching has gone down well - it gets them outside in the fresh air! I encourage my grandchildren to create some artwork for other family members and to listen to and help their siblings! We play games together, read together & solve puzzles. We have to walk everywhere because I don't drive so if we have to walk to somewhere specific we make up an adventure for a long the way.... We have lots of walks in the jungle and imagine what animals we might see! I encourage my niece and nephew to be outside as much as possible when there with me and to talk as much as possible - they have such amazing information to offer. We love doing arts and crafts and baking. Where Does Milk Come From?